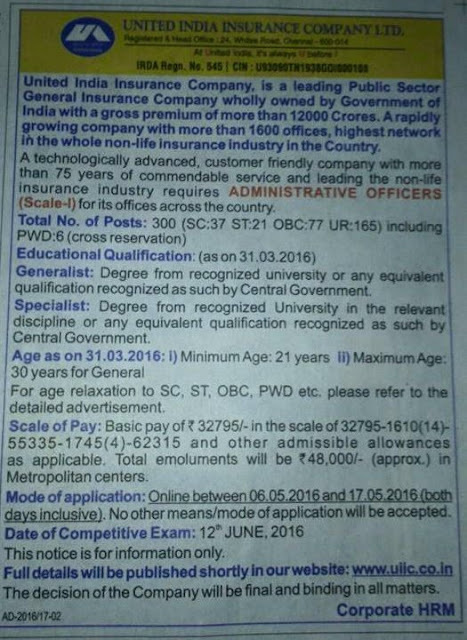 United India Insurance Company Ltd (UIIC) Has Published the Recruitment Notification for Administrative Officer (Scale-I) Posts. Eligible Interested Candidates Can Apply Via Online Mode. Last Date for Submitting Online Application form 17 May 2016. United India Insurance Company Ltd (UIIC) Recruitment 2016 For Administrative Officer (Scale-I) Post.